Tirreno Adriatico finished with Tuesday’s Time Trail. For Team Sky and Chris Froome there was perhaps disappointment that he was unable to emulate Richie Porte in Paris Nice and win the general classification. With talk of a breakaway world series ahead of the start of last weeks races it could be seen that some of the world tour teams were sending coded messages to the UCI by running their A squads in the Tirreno. Sky were led by Froome with most of his helpers from last years Vuelta supplemented by new signings Dario Cataldo and Joe Dombrowski. 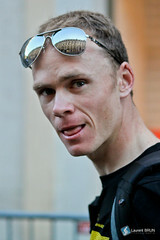 Froome faced a stellar cast of GC contenders in Alberto Contador (Saxo), Vincenzo Nibali (Astana)and Cadel Evans (BMC). There was plenty of room within the field for other stories to be played out a week ahead of Milan San Remo with the sprinting hierarchy represented by Mark Cavendish (OPQS), Andre Greipel (Lotto) and Peter Sagan (Cannondale). There were metaphorical raised eyebrows in France that the world tour teams appeared to be placing Tirreno ahead of Paris Nice with their selections but at the end of both races the teams looked justified as Tirreno led the way for incident and excitement. Porte had seemed uncomfortable with the leaders mantle to begin with, sometimes looking like he needed to be reminded that he could call the shots. Certainly he had a strong pairing to work for him at the front with the ex Movistar riders David Lopez and Vasil Kiryenka impressing on the climbs also. Sky’s other new signings at Paris Nice Jonathan Tiernan-Locke and Ian Boswell had a tougher time. Brian Smith, JTL’s ex manager suggests that he would be better suited for the classics. but Sky have him earmarked as a GC rider. Other than flashes when the race entered the climbs he cast a rather forlorn figure before abandoning due to illness on stage 5. Boswell was conspicuously out the back on most days and will no doubt be expected to improve. Porte’s moment of clarity about being team leader probably came at the end of stage came at the end of stage 4 when Andrew Talansky (Garmin) took the yellow jersey and stage win. Porte and Sky were super strong the following day with a summit finish that allowed Porte to demonstrate his superiority on the climbs. The possibility of Talansky wresting back the yellow on the final day’s TT was demolished when Porte’s time split came on screen. It’s not surprising that speculation about Porte as a potential GC winner at the Giro next year has begun. VCSE wonders if Dave Brailsford can imagine a world where his two GC contenders are Froome and Porte rather than Froome and Wiggins. As Paris Nice was reaching its climax Tirreno Adriatico was just beginning to warm up. Omega Pharma had Cavendish in the leaders jersey until Saturday after the opening team TT and his consistent sprint placings on stages 2 and 3. Beaten in both, Cav, his lead out, or a combination of the two didn’t appear to be firing on all cylinders. Peter Sagan’s strong start to the season continued with stage wins book ending the summit finish action at the weekend. Froome had appeared beaten on the climb to Prati di Tivo on Saturday but produced a stunning victory that left his rivals shell-shocked riding up to their wheels, then around, before soloing up to the line. Sunday’s stage to Chieti with its final kilometres formed of narrow streets and double digit ramps were Froome and indeed Sky’s undoing. As with the Vuelta last year he looks vulnerable to attack on short, steep climbs. As the finish approached Froome burnt all of his supporting ‘matches’ and was spent going too early for the final intermediate sprint. losing out to Contador. Purito Rodriguez rode away from everyone on the final climb which left VCSE wondering about Katusha and ‘ethical reasons’. Chieti’s climbs were familiar ground. On Monday the penultimate stage visited the 300 odd metres of the Muro di Sant’Elpidio and its 27% ramps not once but twice. The height of the climb was the deceiver in what appeared to be a fairly innocuous stage. The sight of the worlds best riders resorting to walking in some cases and more than fifty abandonments is an indication of just how tough the climb was. RCS, the Tirreno organisers, admitted the following day that yes perhaps it had been too much. Spare a thought for BMC’s Taylor Phinney who at least completed the stage, but at 35 minutes down missed the time exemption. A second day of this type of climb did for Froome as leader as he again lost his support and even lost out to the likes of Sagan on the Muro. Sagan re bonded with last years team mate Nibali to share the spoils of stage win and leaders jersey ahead of the final days TT. The Tirreno also saw a renaissance of sorts for Damiano Cunego who starred in a solo breakaway on Sunday and was part of the group break on Monday. His efforts rewarded by the King of the Mountains jersey. Froome’s challenge at the Tour will be to use his domestiques wisely. While the Tour is unlikely to feature the type of ramps seen in Italy or Spain a double ascent of Alpe d’Huez will not take prisoners. Sky look to have all of the cards with their domestiques this year. Kiryenka and Lopez in Paris Nice and Cataldo in the Tirreno all impressed, looking like the can ride at the front all day and with Porte returning to normal duties in the grand tours Sky’s first six names on the team sheet have probably already been written. Next Next post: ‘#sadomaso’ – The toughest climb in cycling?